Show Shouts highlights noteworthy new and upcoming podcasts from across the vast and still-growing audio medium. spit: iHeartRadio’s latest original podcast, titled spit, is an unusual collaboration with the personal genetic testing company 23andMe. The program is hosted by writer Baratunde Thurston, who will lead conversations with artists, celebrities, and other experts on the topic of identity. The first episodes bring on John Legend, Wyclef Jean, and Melissa Etheridge as guests. Listen on iHeartRadio. 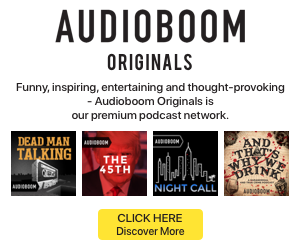 The Oval Office Tapes: Cadence13 and Blumhouse Television — which has backed critically acclaimed film projects Get Out, Whiplash, and The Purge franchise — have teamed for a fictional drama podcast centered on real-life political figures. The Oval Office Tapes will present a what-if look behind the scenes of Donald Trump’s White House, with the people in his administration depicted in a journalistic style. The show was created by filmmaker R.J. Cutler, while screenwriter and political reporter Scott Conroy is its showrunner and co-writer. The show will be available on Apple Podcasts, Spotify, Google Play, and other on-demand audio platforms beginning September, 14, 2018. First Degree: First Degree is the latest new launch on PodcastOne. The show presents new angles on crimes as told through the stories of people who were just one degree removed from the people or events in question. The show is helmed by true crime television producer Alexis Linkletter, investigative journalist Billy Jensen, and Jac Vanek of the Ladygang podcast. Listen to First Degree on PodcastOne and Apple Podcasts. Quick Hits: Musicians’ streaming venture. Tackling fraud. Producer residencies for women.